The Upper Cumberland Region of Middle Tennessee and Southern Kentucky is home to some of the world’s finest marble shooters. Local games, played since childhood, still fill the yards and fields of this area in the foothills of the Smokey Mountains. From the Monroe County Marble Club Super Dome in Tompkinsville, Kentucky, to Malcolm Strong’s Tennessee-Square yard at his home in Moss, Tennessee – these local folks still play the games of their youth, right here where they learned it growing up. Learn the rules and regulations of the three games held in honor here (Rolley Hole, Tennessee Square, and Ringer), and hear the tales of those who have taken their marble savvy to the next level…the world championships. 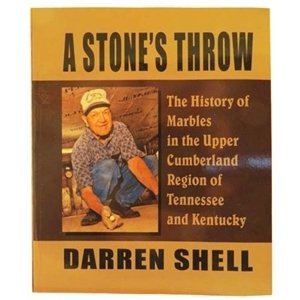 Author Darren Shell delves into the local folk fancy of marble gaming, documents the many facets of its simplicity and shows the sportsmanship that gives this old-fashioned game its place in the hearts of many. Soft Cover Book. Fideli Publishing.